Trans-Americas FSC produces high quality grades of secondhand clothing that are sold worldwide. Eighty five employees sort 70,000 lb/31,800 kg of used clothing daily into 300 different grades of secondhand clothing. All of our exports are processed in our facility using one of the industry's most sophisticated material handling systems. Our advanced mechanization enables us to produce high-quality grades on a consistent basis. No finished goods are purchased from outside vendors. Trans-Americas guarantees all of its clothing. You may Tour our Facility online, and you are welcome to visit our plant in Clifton, NJ by appointment. If you do not have experience buying secondhand clothing please review First Time Export Buyers. 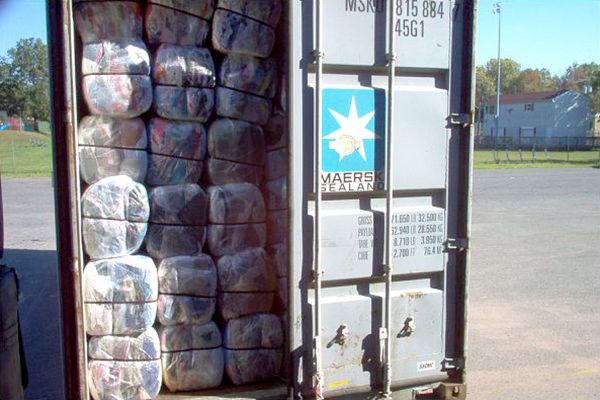 Trans-Americas packs customized bales of secondhand clothing in virtually any size from 100 lb/45 kg, 180 lb /82kg to large 1000 lb/450 kg. We regularly load 540 bales (100 lb) per 40' HC container and 250 (100 lb) bales per 20' container. Trans-Americas' quality secondhand clothing sells in markets worldwide; for three generations our used clothing bales have earned a reputation for value - the highest quality clothing sold at competitive prices. *Premium mixes comprise 3-4% of what is processed daily. This clothing is in perfect, near new condition. It is graded and examined 2-3 times before baling. Because we process 30 tons a day, we accumulate large volumes of this highest quality clothing.